I spent all of last week dogsitting. I should rephrase that. I spent all of last week dogsitting AND housesitting. What that means is that I didn’t see my apartment for a solid six days. I forgot to pack a pair of heels for work. I didn’t bring enough pairs of socks. I did manage to bring a few perishable items from my fridge, but not enough. So my eating has been a bit slapdash. But, I did manage to discover a new favorite snack. 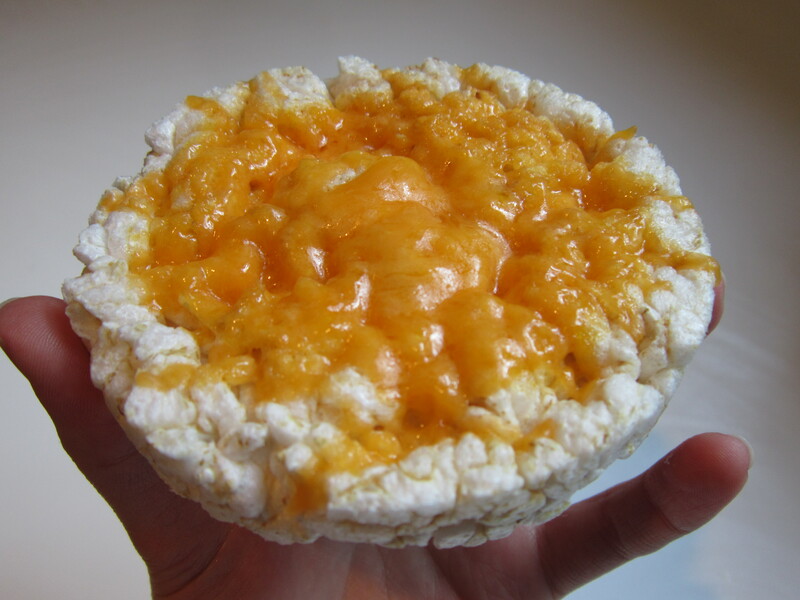 A plain brown rice cake, topped with a few tablespoons of shredded cheddar and microwaved for 12 (yes twelve) seconds. I realize that it kind of makes me look like a drunk, kitchen-deprived college kid. But that’s not really all that far off from the truth anyway. No shame. Being without my kitchen or stash of groceries also meant that I had the opportunity to dine out more frequently than usual. 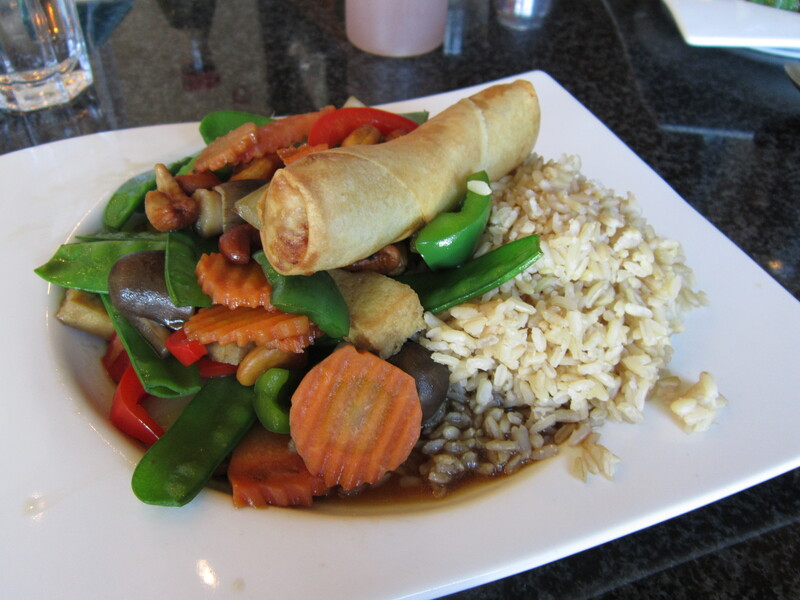 That was a mid-week lunch of stir fried tofu and veggies with cashews, brown rice and a veggie egg roll from a little Thai restaurant near my office. I ate all my veggies. I mean, if I can’t cook for myself at least I’m getting nutrients, right? Plus, look! 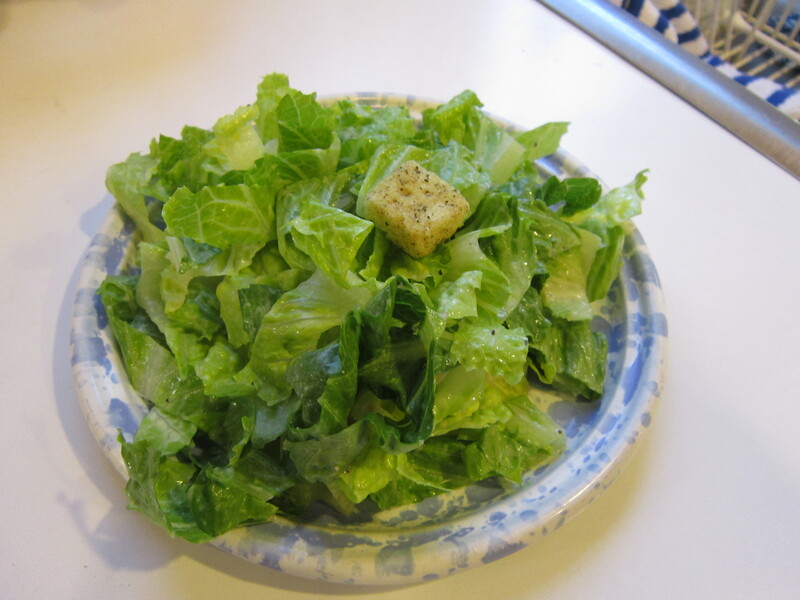 I stole lettuce from my parents’ house and made a salad! I’m weird. I just wanted one crouton, so I had one crouton. God bless America. Anyway, that’s where I’ve been. I made it through the week and got settled back in at my apartment. I haven’t made it to the grocery store yet, though, which means that the eating-out fiesta continues and I have some restaurant reviews to post over the next few days for all you local folk. One of these days I might even have a recipe for you! Stay tuned. Almost everything I’ve tried – covered in cheese and microwaved – is an awesome snack. 🙂 I don’t care if it makes me look like a drunk college kid! Ha! We used to house/dogsit for this lady who had the NICEST house ever. It was awesome. It was like the greatest game of playing house one could imagine. There were always pizza bagels. Always. This is kind of like a poor man’s pizza bagel. Sigh. Drunk and deprived? Hell no. I eat nuked Ritz crackers topped with cheese like substances fairly regularly. Also, I’m drunk fairly regularly. All my kitchen utensils are packed, so I’m either eating out or frozen food for the rest of the week. I honestly don’t mind it. It really is a science when it comes to melting cheese on things in the microwave. 12 seconds sounds legit. Seriously. You nuke something too long and it either gets mushy or hard as a rock. I actually really like rice cakes. I like how they kind of deflate on your tongue. Melting cheese on them is just a good idea, I don’t care how old you are.